It is difficult to find information on traditional Turkish wedding cakes since there are many variations in the traditions of the different ethnic groups that reside in Turkey. Modern wedding cakes are in the European tradition and are usually sponge cakes with fruit or chocolate fillings and ornate decorations. Once frosted and decorated all in white, wedding cakes now feature brightly colored decorations. 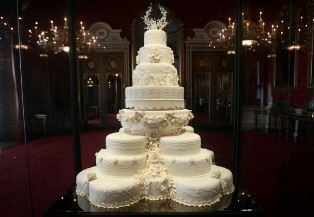 Most wedding cakes are tiered since they are intended to feed large numbers of guests. According to the available information, the traditional Turkish wedding cake is a three tiered fruit cake frosted in Royal icing. Royal icing is a hard, white frosting made with egg whites and powdered sugar. Most bakers cover the cake in marzipan before applying the frosting to prevent it from becoming discolored from the fruit in the cake. Turkish fruit cake is not like the hard, dry, heavy cake made in much of Europe. It is light, moist and sticky with wafer like layers of cake. A popular staple of baking for many years, Royal icing has fallen out of favor due to the risk of salmonella presented by raw egg whites. Bakers wishing to replicate a Turkish wedding cake can substitute powered merengue or pasteurized egg whites in the recipe. These items are available at most supermarkets. There are no specific recipes for Turkish wedding cakes, but a recipe for a Turkish fruit cake should work well. If a traditional cake is to be prepared at a wedding venue, brides usually need to give the caterer several weeks advance notice. Customs surrounding the cutting of the wedding cake are similar to those in Europe and the United States. The cake is cut following the wedding meal by both the bride and groom. Pieces of the cake are presented to each guest but unlike Europe and the U.S., in Turkey it is considered rude for a guest to decline to eat a piece of cake. The cake is not served as a dessert, but is, instead, served after the dessert. Western style wedding cakes are preferred by most Turkish brides and they are available in many colors and styles. Few modern wedding cakes are frosted; most are covered with fondant, a sort of sugar dough that is rolled out and wrapped around the cake. Fondant can also be shaped into decorations and is easier to work with than icing. There is really no discernible difference between modern Turkish wedding cakes and those found in Europe and the U.S.